Following the tender, traders moved quickly to place FSU prilled urea and Arab Gulf granular urea – in addition to the expected tonnes from China. This is the first time since first half 2013 FSU urea has been supplied to India through an import tender. Naturally, this movement supported both Black Sea and Baltic prices this week. 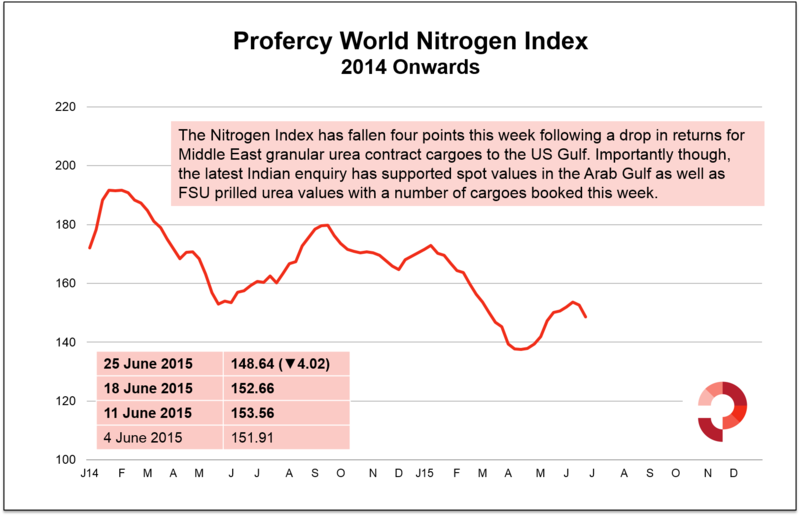 However, Profercy’s World Nitrogen Index has fallen four points, the first significant downward movement since April. This is primarily due to the drop in US Gulf urea values for prompt and deferred barges. In trading this week, prompt barge values fell by as much as $20ps ton with all July barge values moving below $300ps ton earlier in the week. Over the last month the US market has provided healthy returns for Arab Gulf contract cargoes compared to other key markets, with these returns supporting gains for the Nitrogen Index. While prompt values remain high, the drop has lowered the returns available to Arab Gulf contract cargoes and consequently the Nitrogen Index. Profercy’s Nitrogen Index is currently at 148.64 points, down 4.02 on last week. For our full weekly market analysis, including key prices and details of latest trades, bids and offers, please provide your details here.